A person with Parkinson’s Disease may be experiencing several symptoms at the same time; your history taking and physical assessment should elicit the main issue(s) to prioritise as part of the management strategy. Whilst physiotherapy concentrates on the physical manifestations of a disorder, don’t forget to pay attention to how their other symptoms impact on the person’s lifestyle. Remember also that optimal outcome is achieved through the collaboration with others from a team of health and social care professionals with expertise in other domains of Parkinson’s, from volunteers, family and friends. 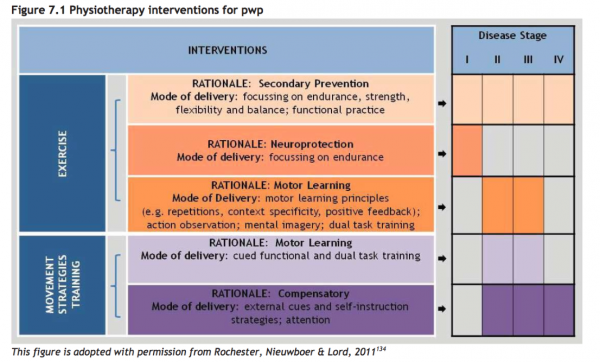 The Review version of the European Physiotherapy Guideline divides physiotherapy intervention for Parkinson’s into exercise and movement strategy training. Increasingly being proven to maintain health and well-being in more than just Parkinson’s – exercise can address secondary prevention (focusing on strength, endurance, flexibility, functional practice and balance); exercise for neuroprotection focuses on endurance; and exercise using motor learning principles uses approaches, such as mental imagery and dual task training. Exercise undertaken in a group setting has the added value of providing a social connection to those becoming increasingly isolated as the condition progresses, or for those who are newly diagnosed, so they can see the benefits of maintaining exercise and activity. A group environment also permits time for people to ask questions and discuss their symptoms and own management strategies with one another. Basal ganglia disorders cause deficits in the generation of internal (automatic) behaviour. Strategies (physical or attentional cues and combined strategies) can help overcome some of the resultant problems, hence have become an increasingly utilised method of intervention for people with Parkinson’s. We can see immediately the effects of external cueing and attention on improving step length, freezing and turning during walking tasks, and in activities of daily living. Depending on the cognitive state of the individual, they may be able to learn how to self-instruct in the use of an internal cue or strategy. If less able, the cue or strategy has to come from an external source e.g. a visual strip on the ground, the rhythmic beat of a metronome. As mentioned in the subsection on Physiotherapy for Parkinson’s: Referral and assessment, during the earlier stages of diagnosis, greater emphasis is placed on education and self-management. The individual should be encouraged to continue being active and participate in physical exercise for as long as possible. Significant respiratory complications develop in many people as their Parkinson’s progresses, so attention should be paid to monitor and manage encroaching weakness of respiratory muscles and rigidity of the thoracic cage. Most people who are diagnosed with Parkinson’s are aged 50 or over, but 1 in 20 of those diagnosed are younger than this. Those with young onset Parkinson’s are more likely to exhibit early dystonia and motor fluctuations and dyskinesias, caused by prolonged use of dopaminergic treatment. These non-pharmalogical interventions are effective in increasing the Healt-Related quality of life (HRQOL) according to Lee's meta-analysis. But since there is a big heterogenity between the interventions, more research is needed to take firm conclusions. Usability and Validation of the Smarter Balance System: An Unsupervised Dynamic Balance Exercises System for Individuals With Parkinson's Disease. Would you like to earn certification to prove your knowledge on this topic? 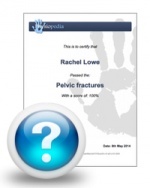 All you need to do is pass the quiz relating to this page in the Physiopedia member area.